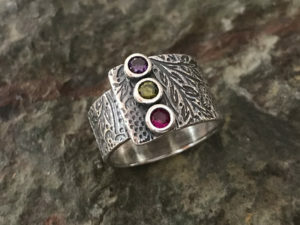 In this class you will create this lovely wide band, textured, wrapped style ring. Make your ring unique from the variety of textures that will be provided. Learn how to refine the inside of your ring to look seamless. Sizing a ring correctly to accommodate for clay shrinkage will also be discussed. Three clay bezels will be created to house your cubic zirconia stones. There are several colors to select from, it’s all up to you! Price includes use of tools. Pieces will be fired in kiln off premises, delivered when ready. Fee includes Materials Fee for use of syringe + 3 qty – 3mm Cubic Zirconia stones. 14g Art Clay Silver can be purchased in class for an additional $43.50. *Prerequisite: Intro to Art Clay – Let’s Play with Metal Clay +6 hours additional experience. Please call us at 626-529-2863 to register.